Soft, unleavened bread similar to a pancake, usually made from tef, a grain with a mild, nutty flavour. When we ate this I described it as looking like old and rather tired tripe. 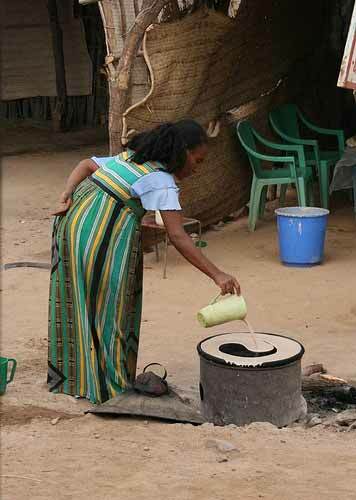 Jenny McCann sent the following description from Ethiopia: "Injera is supposedly a kind of bread but it is in fact more like a vast very thin round flat sourdough crumpet, coloured the pale, tired grey of launderette-washed whites and with the texture of tripe. It comes in two forms: tablecloth (in its round, flat form, 2 ft across, served on a round metal tray with the meat in a bowl on it) or toilet roll - the same but rolled up and chopped into lengths. It serves as tablecloth, cutlery and napkin and in my opinion is completely inedible".